Part two of the Star Wars:Reborn Prequel Trilogy FanEdit saga. After 10 years it's about time I could watch the Star Wars Prequel trilogy without feeling physical pain! But not just that, they should be out and out pleasures to watch! ...and so the idea for 'Star Wars:Reborn' arrived. My goal with these edits was to create versions of the PT that were to put it simply 'enjoyable to watch'. I wanted to make good versions of these films that still felt like the same films in essence. The watch word is CHARACTER! Other great edits streamline the films down to 90 mins but for me a true SW film should give you around 2 solid hrs of entertainment (And not 2.5hrs either!). So I've made sure you'll enjoy spending these 2 hours in this universe. I've achieved this by:- Trimming action scenes to increase pace. Reworking all major Lightsaber duels. Evaluating and then editing every line of dialogue that I felt didn't work. Adding a few OT music queues. Adding portions of most but not all deleted scenes back in. Removing over-the-top CGI shots and Digi-Doubles and changing characters to be likeable and believable. Of my 3 'Reborn' edits AOTC required the most editing to put it right. TPM:R had more changes (Well over 300) but alot of those were subtitle or audio changes, AOTC's 279 changes are almost all edits to the actual footage. It's not just that the editing was bad from an acting/dialogue, story and character point of view, it's that the pacing was all over the place and the scenes were badly constructed (Especially the action scenes). This edit clocks in at just over 2 hours, 27 minutes shorter than the theatrical cut, despite re-introducing an extra 6 minutes of deleted material. As with all three of these edits I've kept 'Improving Character' as my primary goal over other considerations. In the theatrical cut Anakin was an annoying and petulant kid who was constantly arguing with his hated mentor Obi-Wan before turning his dislike towards Padme. They then have a series of bitter rows that somehow culminates in them falling in love. But in this cut Anakin is likeable yet fallable, he has a friendly rivalry with Obi-Wan and his romance with Padme grows naturally accross the length of the picture (Oh and I also implied through editing that they "Get jiggy with it" one night on Naboo). Padme herself is now a powerful and important Senator, so much so, that much of the plot revolves around her and the Army-creation-act she opposes. Also Jar-Jar's role is minimised and rewritten while young Boba is a silent angry kid, much like his father and the man-of-few-words that he will grow up to be. 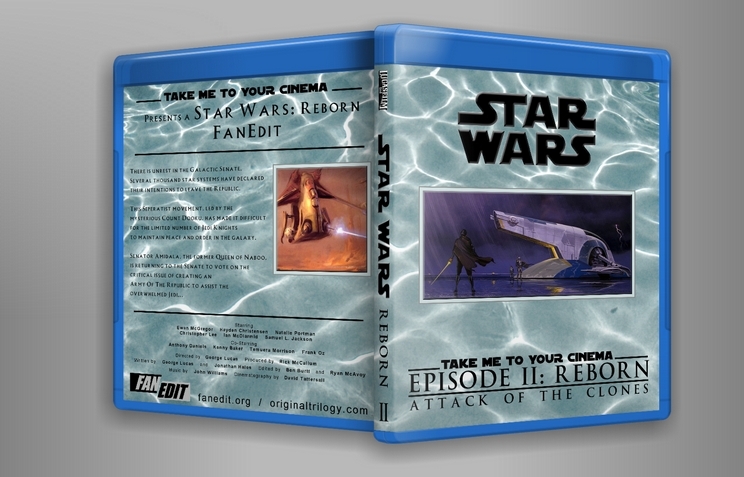 So sit back Popcorn in hand and prepare to actually enjoy AOTC!...as unlikely as that sounds. I was excited by reading Adywan's plans for the SW:PT trilogy on the Revisited website and knew this would be years in the making. So I decided to try and fix them for myself. I felt the problem with the PT was "Likeability". If you liked the characters, liked the scenes and liked the dialogue you shouldn't need to chop the films down to 90 mins or less. Because you'll want to spend the full standard SW 2 hours in this world just like the OT. In this edit I've trimmed bad dialogue and acting throughout, recut, condensed or removed scenes, rewrote most subtitles, inserted the classic Fox and Lucasfilm logo opening, made Padme more powerful and important, made Anakin likeable and made their romance believable. I've also added back five deleted scenes (But trimmed those for quality too). I hope this is the second part of a trilogy that people are truly going to ENJOY! - Young Boba remains silent making him seem angry, cold and more in keeping with ESB's Boba. - Anakin and Padme do not have a number of bitter arguments (Before inexplicably falling in love). - No uses of the phrase "Younglings". - All subtitles partially or completely rewritten to alter character and story. - 00.06.25 NEWSUB "The oyalist Commitee has arrived, your honor." - 00.06.29 NEWSUB "Shall I admit them?" - 00.09.04 New Jar-Jar dub and SUB "Obi...? Ha ha Obi,"
- 00.09.07 New Jar-Jar dub and SUB "it's been so many years." - 00.09.11 New Jar-Jar dub and SUB "Senator Amidala..."
- 00.09.12 New Jar-Jar dub and SUB "our old Jedi friend has arrived,"
- 00.09.16 New Jar-Jar dub and SUB "master Kenobi." - 00.10.52 New Jar-Jar dub and SUB "You've sure grown in 10 years Ani,"
- 00.11.06 New Jar-Jar dub and SUB "No, it's just a long time my friend." - 00.54.27 NEWSUB "Away with you!" - 00.54.30 NEWSUB "Hello Watto,"
- 00.54.33 NEWSUB "Let me fix that for you." - 00.54.36 NEWSUB "What? What o you want?" - 00.54.40 NEWSUB "Wait! You're a Jedi!" - 00.54.43 NEWSUB "Whatever it is, I didn't do it." - 00.54.51 NEWSUB "I'm looking for Shmi Skywalker." - 01.05.49 NEWSUB "The commerce Guild's forces are arriving as we speak"
- 01.17.33 NEWSUB "The time for debate is over, we must have an army." - 01.19.23 Obi-Wan "Traitor" line removed and re-dubbed with "Dooku"
- 01.26.41 NEWSUB "Prepare her for trial"
- 01.26.44 NEWSUB "You have been charged and found guilty of espionage." - 01.26.55 NEWSUB "War is our business Senator Amidala,"
- 01.26.58 NEWSUB "Your senate will find us more than prepared." - 01.27.07 NEWSUB "Your Jedi friend is waiting for you Senator..."
- 01.27.13 NEWSUB "...in the arena!" - 01.29.40 NEWSUB "Welcome, today's games are in honor of Viceroy Guneray!" - 01.29.20 NEWSUB "Guards, open the cages!" - 01.37.21 Yoda's "...A perimeter create" re-dubbed to "...Create a perimeter"
- 01.39.20 NEWSUB "Our communications have been jammed." - 01.41.15 NEWSUB "We have to order a retreat." - 01.41.23 NEWSUB "I'm sending my warriors to hide in the catacombs"
- 01.41.27 NEWSUB "They must not find our designs for the ultimate weapon." - 01.41.33 NEWSUB "If they find out what we're planning,"
- 01.41.36 NEWSUB "we'll lose all support in the senate." - 01.41.40 NEWSUB "Here my Lord." 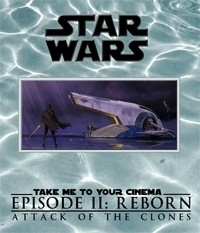 As in Episode I, TM2YC manages to extract a Star Wars-ish movie from the Attack of Clones. I really enjoyed this edit and once again I feel TM2YC sees what Lucas meant but seems unable to do anymore. Lets see... What I hated of the original? Anakin character is annoying at best, unbearable at worse. Consequently you get the feeling that Obi-Wan is the worse mentor ever, how can he possibly transform the nice child of Ep.I in such a persons? Even if Anakin is such a douchebag Padme falls in love with him with some of the worse romantic dialogs ever. To cite Darths & Droids notes: "Writing this[375th strip] we have a new-found appreciation for just how time-consuming and horribly difficult it is to write truly awkward romantic dialogue. George Lucas is a genius." The Jedi council decides to split the pair sending Anakin to his first solo mission while Obi-Wan disagrees, but Joda arrogantly says the council is sure of the decision. This edit fixed all of that, ALL OF IT. Anakin is not humble, but still he respects and loves his mentor; he actually knows Obi-Was is powerful and wise and he has much to learn. Removing the nonsensical disagreement with Obi-Wan Anakin's mental breakdown after the death his mother appears felt and hearth-wrenching; the difference with the theatrical release where Anakin appears a spoiled child is impressive. Reintroducing the deleted scenes Amidala appears as a powerful politician and everything revolves about her pacifist ways that still fail to stop the arrival of the clone army. The love story works much better and you actually think that Captain Typho, Amidala bodyguard, was right thinking that she can importunate him more than vice-versa. Kenobi is still worried for the solo mission of this apprentice, but TM2YC used a deleted scene where Windu states to have faith in him instead that the council is sure. Considering how Anakin is better than in the theatrical version the scene works much better. The cut-n-past job is really visible only during the final duel Doku against Yoda; Yoda appears much less agile and prefers using the force than the sword. All considered the new duel is probably better as in the original where it seems Yoda could destroy Doku ship with debris, but for some reasons he does not. Here he has hard time defending himself and rescuing Obi-Wan and Anakin.